Well, we’ve arrived at our first Friday The Thirteenth of 2015. (Since this is not a leap year, you can expect another in March. We won’t see another until November.) Some in western culture do see it as an “unlucky” day (as if there really were such a thing as luck, but that’s a topic for another day!). 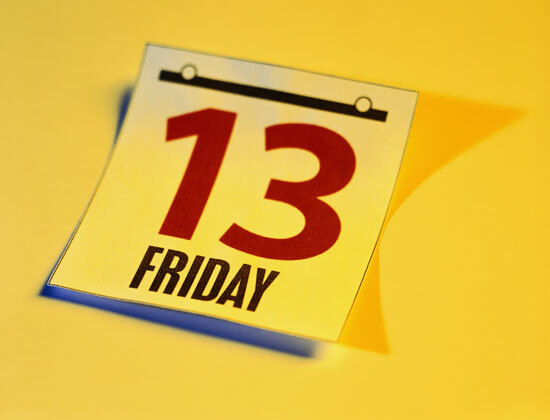 The fear of Friday the 13th is called paraskevidekatriaphobia. I don’t know if anyone seriously fears these days anymore; most of the time, what I see on social media just laughs them off. But one thing is for certain: human beings do have fears. It’s part of who we are as those who live in the time after the fall of humanity. And it’s amazing what we will do, sometimes, to compensate for our fears. People who are afraid of heights, for example, will normally try to steer clear of places where they fear they may fall a great distance, such as roofs, balconies, or mountaintops. People who are afraid of dogs will try to stay away from homes where dogs may be kept as pets, or from pounds, kennels or veterinary clinics. Some fears, though, can’t be compensated for. They must be faced. One might be afraid of public speaking; I think I read that this is the commonest of all fears. And while some people may be able to escape it their whole lives, others must speak publicly, whether for their employment or to voice a conviction or to laud someone at a retirement banquet or a funeral. Sometimes, upon conquering the fear once, it is discovered that it can be conquered again. Soon enough, the individual realizes that the fear wasn’t all that rational after all. Followers of Jesus, like everyone else, experience fear. But we have an additional source that can encourage us to face our fears. King David, who had his share of enemies during his life, proclaimed, “The Lord is my light and my salvation – whom shall I fear? The Lord is the stronghold of my life—of whom shall I be afraid?” (Psalm 27.1, NIV). It would have been easy for David to run into the Judean hills and hide from his enemies, but he stood fast because the Lord was with him. Whatever fears you may face, the Lord will be with you, too. Why not make Friday the 13th an occasion to rejoice in the Lord, who has the power to take away our fears? Do you have any irrational fears? That’s typically what a “phobia” is: an irrational fear, or a superstition. Remember, “Walk on a crack, break your mother’s back”? Or how about “bad luck” for 7 years if you break a mirror. All silliness…right? Today is Friday the 13th. Motorcycle enthusiasts in Ontario love this day, because they typically take the day off and ride their hogs to the otherwise idyllic town of Port Dover, Ontario, for a rally. But some people have irrational fears about the number thirteen, especially when it lands on a Friday. Any of these superstitions and phobias may haunt us as children, but hopefully, we grow out of them. And as followers of Jesus, we don’t believe in “bad luck” anyway; we don’t even believe in “good luck”, because, as Christian writer Wayne Oates put it in his book title, luck is a “secular faith”. In some ways, saying “good luck” to someone, if we stop to think about it, is about the same as saying, “May the force be with you.” It may be intended as well-wishing, but in the end it is quite impersonal. One of my university professors, a good Dutch Calvinist, never wished us good luck when giving us an examination; rather, he said, “I wish you the best of success.” In other words, he wanted us to do well, but he knew that there was no impersonal force, or luck, that was going to help us at this stage; if we hadn’t studied, we were up the creek. But he wanted us to succeed. As followers of Jesus, we don’t need impersonal forces to aid us; we have the God of the universe! Who needs “luck” or “the force” when we have the Lord of heaven and earth?! I hope that Friday the 13th is for you, as it is for me, another day to praise the Lord and live for him – not a day to put off otherwise healthy and excellent activity. Enjoy the day! “I look up to the mountains – does my help come from there? My help comes from the Lord, who made heaven and earth. He will not let you stumble; the one who watches over you will not slumber. Indeed, he who watches over Israel never slumbers or sleeps” (Psalm 121.1-4, NLT).